It is one of the greatest matters of shame that the proud Scottish nation is so ignorant of the real identity of the first Apostle to its lands, especially when one considers that he was a son of the soil and not a foreigner. When asked who was the first apostle to the ancient peoples of this country many would give the name of St Columba (Colum Cille) and in so doing would be responsible for the continuation of a great mistake, one of which we should be horribly ashamed! These lands were brought the message of the Gospels long before Colum Cille had even been born. Now this is in no way an attempt to try to diminish this holy man's labours and it is very right and proper that we should remember him. But surely we should be even quicker to remember the great Ninian, the first apostle to these lands, and, unlike Columba, a native of these lands. Some of the Churches established before St Columba arrived in Scotland. God chose no ordinary man to sound the trumpet of the advent of Christianity among the northern Brythonic peoples. St Ninian was a worthy and distinguished teacher in the mould of his own spiritual tradition - having been taught by St Martin of Tours, himself a pupil of the legendary St Hilary. With a superb surety of spirit St Ninian brought the message of the Gospels to the Brythonic peoples - his own people, he having been born a Briton in about 362AD to parents of a tribe thought to have inhabited the area near the Soloway Firth. Not only was he ardent in his missionary work but his foundation at Whithorn, the Candida Casa, soon became a renowned centre of learning to rival any other in the Christian World. From within its walls many were trained who later went into the missionary field to become famous apostles of Ireland and Alba, even as far north as the misty Orkney and Shetland Islands. Well does Ninian deserve the title, "First Apostle of the Picts and Britons". There were Christians already within these Brythonic lands as a result of contact with the few Christians who followed in the train of the Roman Legions. Ninian's parents are supposed to have been amongst these Christians. Having been baptised as a boy he later, when a young man, decided to visit Rome where he is said to have studied there for many years. When he determined to return to his homelands, Ailred says that the Bishop of Rome consecrated him a bishop. To speak of a Pope in these times is unhistorical. The Bishop of Rome was, as yet, simply primus inter pares, and not the sole governor which the Roman Church has built him up to be. On his way home, Ninian stayed with St Martin, Bishop of Tours, and from this soldier-saint, a Christian leader of heroic proportions, he learned the methods and drank the inspiration which dominated him for the remainder of his life. North Britain (or present-day Scotland) in the time of St Ninian was of simpler population than it later became. True, there were sporadic Teutonic raiders on the south-east coast, but the large-scale invasions of the Angles and kindred peoples did not take place till after 449AD. There were also occasional raids on the south-west coast by Scots from Ireland, but the first major settlement of Scots in North Britain is dated about 498AD. North Britain, as it presented itself to St Ninian was to some extent divided by the Forth-Clyde line; north of it were the Picts, south of it the Brythons who occupied the country right to the English Channel. These Picts and Brythons were both Celtic peoples and spoke languages that were similar enough that each could understand the other with relative ease. This is a hugely important fact since it allowed Ninian, a Brython, to travel in the more northern lands of the Picts, converse with them and preach the Gospel to them. We should remind ourselves here that all of this activity took place one hundred and fifty years before St Columba's time. There can be no doubt that Ninian was indeed, "First Apostle of the Picts and Brythons" - first both in time and importance. The Churches, called after St Ninian while he was still living, make an impressive list, so impressive indeed that some have thought it physically impossible for one man to have been their living founder by actual presence at the site. No one can be dogmatic in this; but that Ninian was either the first preacher and founder, or the one who authorised the work and so was the essential founder, of those Churches bearing his name and begun in his lifetime there is no reason to doubt. The difficulty is to fix those Church sites which belong to Ninian's lifetime, and not to count any which owe their Ninianic name to a period when dedications to departed saints had begun, that is, in the 8th century. The success and reputation of Candida Casa was due to the missionary zeal of a remarkable man; but even then, it was only made possible because of the vital energy of the whole community. Only a large, well-organised and enthusiastic establishment could have carried out such a sustained and exacting enterprise. The foreign brethren who St Ninian brought with him from Marmoutier set themselves to train natives who had become Christians under their influence, so that a steady stream of disciples was prepared over the years to continue the missionary work. The reputation of Candida Casa, known to the Irish as Rosnant or Rosnat, continued for centuries after Ninian's death. 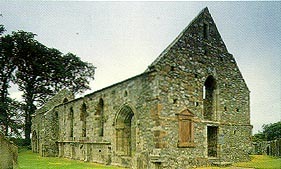 St Finbar (Finnian to the Irish, to the Brtions Winnan), was connected for twenty years with the work of Candida Casa; he founded various churches in Scotland, went to Ireland and established, about 540AD, the great monastery of Maghbile (Moville). There Columba himslef was one of his students. At Candida Casa was educated St Enda who became abb. of Aranmore in the Bay of Galway, the teacher in turn of Finnian of Clonard and Kevin of Glendalough, and other famous heads of Irish monasteries. St Tighernac of Clones and St Eogan of Ardstratha, near Derry, were trained at Candida Casa then under the abbacy of St Nenio (also called Manchan). Caran'oc, probably trained in St Ninian's time at Candida Casa, became abbot of Candida Casa, and was the first of Candida Casa's pupils to go as a missionary to Ireland; according to one record it was he who baptised St Patrick. These are enough to show that Candida Casa was an outstanding religious and educational establishment. It had close relations with the Church in Ireland, which owed much to the men it trained. These pupils contributed nobly to the burning zeal which in the seventh and eighth centuries covered Europe to the Danube with Irish manachs and even north to Iceland and Greenland, and south to the Canaries. St Ninian it was who lit the fire which raged across this vast area - such was the measure of the man. St Ninian was the father of Christianity across most of modern Scotland, much of Ireland and, eventually, huge parts of Europe. St Columba was the father of Christianity to the Scots peoples of that small coastal area west of Druim Alban. Now, will the reader please answer this question - why is it that we venerate Colum Cille to the virtual exclusion of poor Ninian?